That's a fun idea that's actually been around for a while: Artificial reefs from sunken ships. I wonder how many people supporting this idea are against offshore drilling- oil rigs being another artificial structure that fish seem to like? That's kind of like wondering how many people screaming about new cell phone towers are the same ones that think government should provide wireless networks to everybody. Eric Kirk gave me the heads up on the North Coast Journal giving us a heads up on some new legislation introduced by our local state legislators. Not going to deal with them all right now but Wes Chesbro's AB 479 sounds like bs to me. So, just what does AB 479 do? It actually amends the earlier Integrated Waste Management Act of 1989, which I believe is what requires us to divert 50% of our waste from the landfill by some particular date or face heavy fines. That was one of the excuses for forcing mandatory garbage service on residents of Eureka. duties on local agencies regarding solid waste management. Notice he's imposing a yet a new state- mandate on cities and increasing the amount of diversion required from 50% to 60%. Integrated Waste Management Fund in the State Treasury. apportionment to jurisdictions, as specified. Not quite sure what they're doing here but it seems like they're more than doubling the fee that garbage companies pay to dump trash at a landfill and sending that increase to Waste Management Fund (raises for Chesbro's friends on the Board perhaps). for certain costs mandated by the state. is required by this act for a specified reason. Note that the state is supposed to pay localities for at least certain costs imposed upon them. He then says the state doesn't have to pay localities for any costs they incur as a result of this bill. At least that's the way I'm reading it. I'm almost glad he's introduced this, though. I've said here before while talking about all these waste diversion mandates that, although Chesbro wasn't in the senate when the current mandates came around, he would of pushed something like that if he was. What a creep. And that's coming from an avid recycler. S.F. Chron To Shut Down? Looks like the owner of the San Francisco Chronicle is telling that paper to start making money or it will be shut down or sold. Neither option sounds good to me. If things keep going the way they are in the news world, I won't have any news to comment on. A bill was introduced to the state assembly this morning by Assemblyman Tom Ammiano that would legalize personal possession and use of marijuana. The bill would also tax it and regulate it. Figures. Then again, as myself and others have said, pot won't likely ever be made legal unless the government figures out some way to make money on it. I would think at least the Democrats, desperate as they are for money now, would jump in line to become co- sponsors of the bill. More info on the bill on MPP's blog. I'm not sure if this editorial in the Santa Rosa Press- Democrat is the third, or fourth, editorial I've seen come out in support of the new Open Primary proposal that will be on the ballot later this year. I'm fit to be tied over this. Probably more so than I should be. I think it just goes to show what airheads there are behind the editorial desks of most of our newspapers. Seriously; How can anyone think that just because a candidate appeals to middle- of- the- road voters (assuming this Open Primary would accomplish that) he or she can fix a disfunctional state. The majority of voters in California have consistently voted for bond measures, and candidates, that are a big part of the state's financial woes. Somehow, the Open Primary supporters think that this bizarre proposal is going to get government to run better. Unbelievable. As I've said earlier, I could almost see an open primary where voters could pick their favorite candidates from all the parties. I'm not saying that would be right as I think we need to honor the idea of freedom of non- association. I'm just saying that would almost make some sense in that it might form some sort of consensus as to what most people want in a candidate. I'm not saying the proposal I've made above would fix California. I'm just saying it makes more sense to me as far as inclusion, assuming inclusion should be taken into consideration, which I'm not so sure it should. But this idea where you vote for just one of multiple candidates is ridiculous. I suppose it goes to show just how screwed up this state is when so many people think it's a good "first step". I'll go out on a limb and guess that the Times- Standard comes out in favor of this idea when their time comes to editorialize on it. Not much of interest in the news today so I thought I'd take the time to recruit players for the main game in my life, Aces High. To get an idea of what it's like, there are some Youtube videos available online. This one I like simply because I loved the mini- series Band of Brothers. The guy who made the video put together a montage of screen shots from Aces High and added the music from Band of Brothers and named the video Band of Aces. Cool. Runs just over a couple minutes. Here's one of a P47 mission that shows a little of more what it looks and sounds like from a player's perspective. It runs a little over two and a half minutes. The graphics may be different from computer to computer depending of your graphics card, among other things. That video looks a little fuzzier to me than the game does on my computer. More videos of Aces High footage here. They offer a free one or two week trial period. After the two weeks it's just $14.95 a month for unlimited play time. Give it a try and maybe I'll see you in the deadly skies of Aces High. With that supposed Open Primary proposal being passed as part of the budget deal yesterday, I wondered if this would be any different than the other ones we've dealt with. The San Francisco Chronicle explains a bit about the issue. It sounds to me like we've already been there and done this, with the Blanket Primary we had years ago being ruled unconstitutional and the other one rejected by voters. It makes no sense to me to have an election where voters pick one candidate out of between 3 to god knows how many choices. So, you go to fill out your ballot in the primary. You might have two democrats, two republicans and one or two third party candidates. You can only vote for one. That limits your choices. It doesn't increase them. Then you might likely end up in the general election in a race where your choice might be two democrats or two republicans. Once again, this limits your choices. I might actually not have too much of a problem with an open primary where voters could take their pick among all the parties' candidates. For instance, one where you could pick the democrat you liked best, your favorite Republican and even a third party candidate. That might better establish a consensus on candidates and still allow multiple choices in the general election. But this latest open primary proposal stinks just like the last two. Those were dumb ideas back then just like this latest one is a dumb idea now. Despite the headlines in today's Times- Standard, it looks like the Senate passed a budget early this morning and it's now headed to the Governor's desk for signing. They finally got the one vote needed after concessions made to one Republican. Among those concessions was approval of a constitutional amendment to establish an open primary system. What's with that and what does that have to do with the budget? One good thing, at least from my point of view, is they also eliminated the proposed 12 cent gas tax increase. Gas prices are high enough for those of us that have to travel long distances at times. As far as what the total tax increase will cost you, the Sacramento Bee has this tax calculator available. Just replace the numbers with ones that apply to you. I came out much better than expected at an increase of only $182 more in taxes a year. Taking away $44.00 for the elimination of the gas tax increase, that's only $138 a year. Global Warming may well be one of the cruelest—and most costly—frauds perpetrated upon mankind in human history. But it is starting to unravel, thanks to some brave scientists—not the least of which is one of the men on the moon. More than three dozen PhD scientists will join numerous public policy leaders in early March to address the issue of climate change and the alarmism that has come to be associated with it at the annual International Conference on Climate Change (ICCC). And now, it has just been reported that, in addition to highly respected world leaders such as former Spanish Prime Minister Jose Maria Anzar and Czech Republic President Vaclav Klaus, attendees will likely hear some unequivocated straight-talk from former Senator and Apollo 17 moonwalker Dr. Harrison Schmitt. Dr. Schmitt, who received his PhD in geology from Harvard University, recently came out swinging against those who promote global warming as absolute truth. Schmitt denies that the “human effect is significant compared to the natural effect,” and states that political and financial pressure has caused scientists to endorse anthropogenic global warming or simply be silent. "They've seen too many of their colleagues lose grant funding when they haven't gone along with the so-called political consensus that we're in a human-caused global warming," he said. “It's one of the few times you've seen a sizable portion of scientists who ought to be objective take a political position and it's coloring their objectivity." Speaking of those who are unsure of the matter, he wrote that “their research is forced, whether the evidence supports it or not, into Mr. Gore's preferred global-warming template—namely, shrill alarmism.” Dr. Lindzen further stated that "given that the question of human attribution largely cannot be resolved, its use in promoting visions of disaster constitutes nothing so much as a bait-and-switch scam.” Strong words from a high-ranking scientist. Dr. Soon, a physicist at a division of the Harvard-Smithsonian Center for Astrophysics, helped compile over 200 climate studies that, together, covered climate change over a millennium. The findings revealed that the temperature change experienced during the 20th century was not abnormal—in fact, the 20th century was cooler than the Medieval Warm Period, which covered 800-1300 A.D. Too bad that Al Gore decided to cut that fact from his movie. Despite all the alarmist rhetoric on the fabricated “consequences” of global warming inaction...despite the claims of “consensus” and “settled debate” used to goad politicians into immediate action...despite the risk of being 'ostracized' by the political elite—several dozen scientists and policy experts stand ready to show the world that there is not consensus, and that scientists exist who are still willing to offer objective alternatives. In short, the debate (at least) is heating up. Isaac MacMillen is a contributing editor to ALG News Bureau. As has been noted elsewhere, it looks like Ekovox might have rolled up his blog and shut it down. This is horrible. This is probably the biggest tragedy, ever, to strike the Humboldt blogosphere. A fun read by George Will is in the Sacramento Bee this morning. Fun for Skeptics, that is. Believers might want to pass this one by. "...Predict catastrophe no sooner than five years hence but no later than 10 years away, soon enough to terrify but distant enough that people will forget if you are wrong. ".- Gregg Easterbrook's "Law of Doomsaying"
I see the Times- Standard covered that gal I posted about earlier (Sat., Feb 9) that's a contestant in a Lifetime Network competition. Might I have given them the heads up on the story? I don't know, but found it a strange coincidence that Trina suffered from Hodgkins Lymphoma. That's similar, I think, but not quite the same as Non- Hodgkins Lymphoma that my wife has. Oops. I can't get the video to fit into this blog space. Here's a link to the video. Update: The link to the contest page I posted earlier seems to have changed. Here's the new link. Be sure and go there to vote for Trina. Not a bad write up in the Times- Standard this morning on the reasons for the state's economic woes. Much of what they've written has been said here before by yours truly. I can't help but wonder if it must make the folks at the Times- Standard feel a bit awkward. After all, I'd bet money that the vast majority that work there voted for all the bonds and such that the article says contributed to the state's economic mess. I'd only take exception to one part of the article. It's certainly not the first place I've heard it and won't be that last, but I take exception to those that blame this mess on the 2/3 majority requirement to pass a budget. Dan Faulk is quoted as saying, "California is also one of only three states in the country that requires a two-thirds majority vote to pass the budget. While the majority party often gets the brunt of the blame for inaction in government, when it comes to the California budget, the opposite is often true as it only takes a few legislators in the minority party to derail a budget vote.". What does that have to do with anything? I've mentioned here before that the last time our state budget was passed on time was the 2000- 2001 fiscal year budget. That's where they blew all the surplus money from the dotcom boom with permanent spending increases that helped get us to where we are today. It's ludicrous to assume that if the Democrat majority had their way in the legislature and they could pass a budget with just 51% we wouldn't be in the mess we are today. Sure, they would have likely raised taxes years ago, and succeeded. But spending would probably still have outpaced revenue gains, possibly even more so, if just a simple majority could pass the budget. There might be valid arguments for getting rid of the 2/3 majority requirement. The state's current money mess isn't one of them. No need to drive anywhere. Just go here and click on any of the red or yellow dots that signify cameras in Northeastern California. Looks cold over there. Update: Actually, that's the link for Siskiyou County. Here's the one for Northeast CA. I guess when you click on a dot on the NorCal map, you get the county page of wherever you clicked. Then you can click on the camera dots. Ocean Salmon Fishing This Year? Del Norte County's Daily Triplicate reports that salmon runs in the Klamath were real good last fall. So good, some are thinking ocean fishing for salmon might be allowed this year. Ocean fishing for salmon wasn't allowed last year. Not so sure I'm as optimistic as some are over this as this is just the Klamath River and I have yet to hear reports from other ones. Still, that's pretty good news coming from a river with supposed fish- killing dams on it. Carson Park Ranger takes a look today at a new lunch offering available at Eureka's Winco. While he seems a bit skeptical of the product, he reminded me that Winco has become my place of choice for lunch lately. I'd normally paid scant attention to the delicatessen at Winco when I'd go shopping there, but some things caught my eye. So, one day I just had a craving for something I'd seen at the Winco deli and decided to try it out. The only prepared food I'd had there before was their fried and baked chicken which, while good, I can only take so much of as I can't handle grease and fat very well. The first thing I tried, after the baked chicken, was a premade Chicken Alfredo as that appealed to me at the time. I think it was a little over $2.50. Heated it up when I got home and it was pretty good. My only complaint was the portion wasn't quite big enough to satisfy me. Maybe a half size bigger would of left me filled. Couldn't beat the price, though. A day, two or three later, I had a craving for salad. I'd taken a close look at the salads they had available when I was there the other day and they stuck in my mind. I just wondered if there was enough salad for the meal as the containers were relatively small. Not to worry. For between $1.50 to around $3.50, depending on which salad you wanted, there was more than enough. The package size is deceiveing as somehow they really cram the thing full. The downside to that is it can be tricky to eat the salad right out of the container as it decompresses and spills out of the container. Best to take it home and get a LARGE bowl to eat it from. So, you can go from $1.48 for the Garden Salad, which is just vegetables, to just under $4.00 for the Seafood Salad (I'll have to try that one one of these days) and have a nice, healthy, filling lunch. Two of us can buy a salad lunch for around $5.00 total and it's still cheaper than going to a salad bar for one person. One problem with lunch at Winco- other than Leonardi's Pizza- is the deli is all the way in the back of the store. Still, that's quicker than going to Taco Bell and waiting in line. Another is having to wait in the check out line to pay for your salad, but the lines at Winco seem to go pretty quick for me even if there's a lot of people there most of the time. So, I recommend you all join me and my fellow riff- raff at Winco for lunch one of these days, except it's best to take it home to eat it. After all, you musn't forget to wash your hands and you'll need a big bowl, at least for the salad. The Santa Rosa Press- Democrat reports today on yet another scam going around. I'm guessing this one's not actually illegal, assuming they do what they say they'll do for you. The thing is, as the article points out, you can get the same thing done through your county's assessor's office without paying anything. The Marijuana Policy Project is encouraging people to boycott the Kellogg's Company for the silly action they took in regards Olympic swim champion Michael Phelps having been supposedly caught on film smoking pot. Sounds like a good idea to me. I've sent my letter to Kellog's using MPP's action center. I encourage all of you to do the same and go ahead and actually boycott Kellog's products, too. That's easy for me to say and do since I don't buy Kellog's products anyway. Looks like there's some sprinkles finally showing up on doppler radar. Problem is, even if it rains, the forecast is for only around a quarter of an inch. We're just not getting much rain, but maybe I speak too soon? This reminds me of the drought we had back in the '80s. We went year after year without much rain. I remember watching Jim Bernard, the TV weather guy. He'd be saying, Next chance of rain looks like...Possibly some rain coming over the weekend... . Then, even if it did rain, it wouldn't amount to much. The people in Mendocino and Sonoma Counties are gearing up for the drought and announcing possible water rationing. Seems to me it wouldn't hurt to start rationing now instead of waiting until they actually have to. If a miracle happens and they actually get indulged in water, they can stop rationing. Until then, no harm in acting now. State Budget: Where'd The Money Go? The San Jose Mercury News has a good read today looking at the big increases in spending that brought us to the mess we're in now. Included are some numbers I've been looking for. For one, if spending increases would have been held to only account for population growth and inflation, state spending last year would have hovered around 92.7 billion dollars. Current revenues bring in around 90 billion dollars. So, there'd still be a deficit, just not anywhere near as bad as the one we have. As many suspected, prison spending accounted for the biggest share of the spending increases. Following that was state health care. What's disturbing to me is the health care spending, if only because MediCal is supposed to be a big part of that and MediCal has probably the lowest reimbursement rates to doctors in this country. So much so that more and more doctors are refusing to see MediCal patients. Yet, it's still one of the biggest increases in state spending. Lowest reimbursement rates, yet still one of the big reasons for spending increases? Wow. Local Gal Becomes Mylifetime Finalist? I was searching out new sweepstakes this morning, entering sweepstakes being a hobby of mine that I do each morning. I came upon this one from Mylifetime.com. They want you to vote for one of four finalists for some other contest with a prize of $10,000. What a surprise to see one of the four finalists is a local gal. Trina Pockett lives in Fortuna. Never heard of her before. Anybody know her? Not sure if there's more than these four finalists as this was the first time I'd run into this sweepstakes. Now believe me when I tell you that my song is really true. I want everyone to listen and believe. and all the things the neighbors didn't know. feeding all the boys at Ed's cafe. Ronnie helping Kenny helping burn his poots away. Kenny's little creatures on display. You'd see them after school. To some it might seem creepy what they do. The neighbors on the right, sat and watched them every night. I'd bet you'd do the same if they was you. Ronnie helping Kenny helping helping burn his poots away. Kenny's in the Army now and Ronny's taking pills. Oh, how they yearn, to see a bomber burn. Thunder crashing, color flashing, dynamite machine. Wait 'til the fire turns green. I was trying to find all the words to that one but couldn't find anything in a quick search. Did find that Wikepedia covers both the album this was in- We're Only In It For The Money- and even explains the above song- Let's Make The Water Turn Black. I was really surprised that the song was based on real people. I never would of imagined that. How cool. 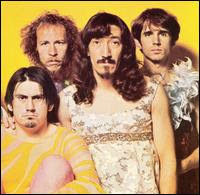 Doc Anchovy has inspired me to search around and maybe buy some Mother's of Invention tapes. DVD player on this computer is broken so I'll have to stick with cassettes. Haven't started looking just yet. Anyone know of a good place to buy old cassettes? Addendum: I found the lyrics to the song. I missed one part. The list you've all been waiting for is available, the Sacramento Bee reports. You can now find out who donated for, or against, Prop 8. Here's the Humboldt list with 199 names. A few familiar names to me but only one contributor I know personally. Cathy Webber, co- owner of Happy Dog kennels contributed to the opposition. I'm surprised I don't see more people I know on either list. Unlike some, I don't recommend a boycott on any person or business listed. Rather than go negative and boycott businesses or people that supported Prop 8, how about doing the opposite and give those that opposed the measure your business? I go out my back door yesterday and what do I see parked across Trinity Street? A mid- sixties Chevy Nova. Quite a surprise to me if only because that's the same car I drove up here when I first moved to Eureka back in '73. Except it's not quite the same as the one I had. 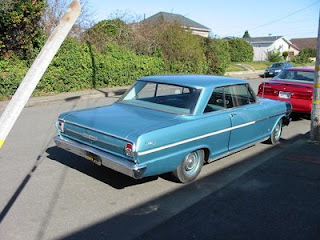 I had a '66 Chevy Nova Super Sport. I had to take a closer look to see the difference as it's even the same color as my old car. One difference was mine had the gear shift on the floor rather on the steering column as this one does. Mine also had, if I recall correctly, the radio antenna over the right rear fender, next to the trunk. Not sure what other differences there might be. Other than that, it's the same car. I'm not all that much into old cars, but seeing something so similar to what I used to drive brings back some memories. I've heard some dumb arguments against the Richardson Grove realignment, but this one is probably the dumbest. Included in the Eureka City Council's agenda for Tuesday night is some supposed campaign reform ideas. Among those being tossed around is a ban on lawn signs. I wonder whose idea that was? I'm not a big fan of lawn signs myself, although I certainly have been known to put a few up during the campaign season. I realize they can be annoying to some. Sometimes I feel like I'm being yelled at when I drive by a bunch of signs telling me to vote one way or the other. Still, they're usually only up for a month or two and I'd say people have a right to express their opinions, especially in their own front yards. Besides, it lets you know who the good and bad guys are around town when they tell you who they're voting for. Actually, I guess she never left. Some of you old timers on my blog might remember I'd refer to the classic liberal/ libertarian writer, Ilana Mercer, on occasion. I'd followed her blog for at least a few years, until it disappeared. She apparently fell victim to a domain sniper and, instead of going to her blog, her domain would take you to advertisements. Happens to the best of us. I had the feeling Ilana would be too proud to pay ransom to get her domain back. I might of been right since after a week or more her blog was still gone. I suppose I could of kept track of her writings as she was a frequent contributor to World Net Daily, but I'd actually removed WND from my bookmarks after they changed their web page format to make it harder for me to sort through their news. As with so many things, I finally gave up on her. Then this morning, as I was going through my morning blog read, I saw her mentioned on another blog and followed the link. I was pleased to find she has a new web page. She even started up her old Barely a Blog blog. Actually, neither the page or blog are new. The blog has archives dating back to 2007, but it's newly rediscovered to me. So, I've bookmarked her web page and signed up for her e- mail list. Hope some of the rest of you do the same. While I may not agree with her on some things, her opinions are very close to mine on many issues.